Doherty, P. C. (2013). 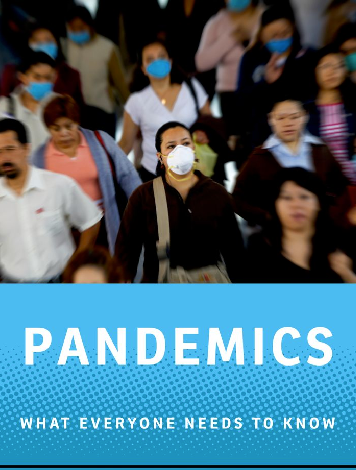 Pandemics: What everyone needs to know. In Pandemics: What Everyone Needs to Know®, Peter Doherty, who won the Nobel Prize for his work on how the immune system recognizes virus-infected cells, offers an essential guide to one of the truly life-or-death issues of our age. In concise, question-and-answer format, he explains the causes of pandemics, how they can be counteracted with vaccines and drugs, and how we can better prepare for them in the future. Doherty notes that the term “pandemic” refers not to a disease’s severity but to its ability to spread rapidly over a wide geographical area. Extremely lethal pathogens are usually quickly identified and confined. Nevertheless, the rise of high-speed transportation networks and the globalization of trade and travel have radically accelerated the spread of diseases. A traveler from Africa arrived in New York in 1999 carrying the West Nile virus; one mosquito bite later, it was loose in the ecosystem. Doherty explains how the main threat of a pandemic comes from respiratory viruses, such as influenza and SARS, which disseminate with incredible speed through air travel. The climate disruptions of global warming, rising population density, and growing antibiotic resistance all complicate efforts to control pandemics. But Doherty stresses that pandemics can be fought effectively. Often simple health practices, especially in hospitals, can help enormously. And research into the animal reservoirs of pathogens, from SARS in bats to HIV in chimpanzees, show promise for our prevention efforts. Calm, clear, and authoritative, Peter Doherty’s Pandemics is one of the most critically important additions to the What Everyone Needs to Know® series. This entry was posted in Electronic books, Science. Bookmark the permalink.